Greetings from a completely different race track! I’m taking a break from my own team’s 24-hour race at Buttonwillow (we’re still running!) to hide in an RV and watch some Formula One. 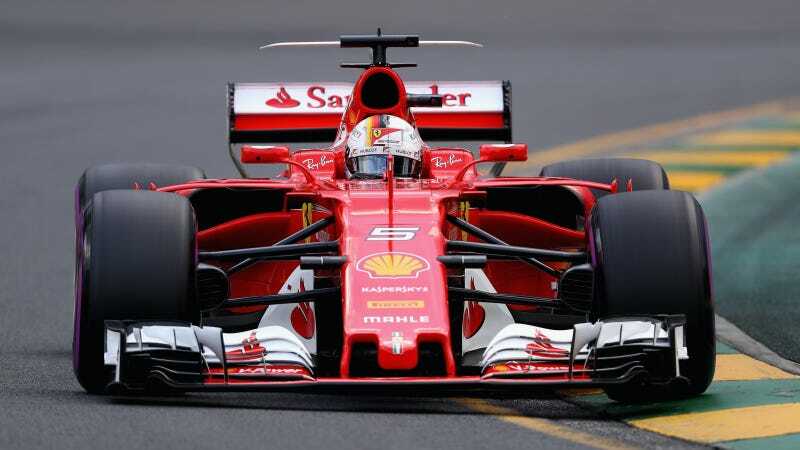 It’s the first year of Formula One’s wider, crazier cars, and they’re off for the season now in Melbourne, Australia. Let’s live blog some racing. In case you missed it, qualifying set up a Mercedes-Ferrari-Mercedes-Ferrari first two rows, with Lewis Hamilton sitting on pole. The results wouldn’t look out of place for 2016, but hopefully there’s more of a fight between Mercedes and the Ferraris up front. Australian Red Bull driver Daniel Ricciardo is having a surprisingly miserable time, snap-oversteering into a barrier during qualifying and ultimately getting a five-place grid penalty for a gearbox change. Now it looks like he will have to retire after his car had an issue on its out-lap and didn’t make it onto the grid. Ouch. You know what? If we meet the mere barrier of “finishing” “not sucking” here, screw it, I’ll do a shoey. Someone needs to do a shoey. This is the Australian Grand Prix weekend, dagnabbit. In the meantime, let’s watch some Formula One. Welcome to our F1 season opener live-blog of excellence.